November 24, 2018, 6 p.m. Between New York Avenue and 9th and H and 11th St. NW Washington, D.C. The new community in the heart of the city begins an annual tradition for the holidays. Families will be entertained with balloon artists, face painters, jugglers, holiday activities and more. November 23, 2018, 5:30 p.m. NE Quadrant of Eastern Market Metro Plaza. Drink hot chocolate and eat doughnuts while listening to holiday carols performed by local choirs and bands. Members of the Didden family will flip the switch to illuminate the tree that honors the late George Didden III for his contributions to the Capitol Hill community. November 28, 2018, 5 p.m. The White House Ellipse. Tickets are required. (202) 208-1631. Nationally known entertainers and a military band perform and the President brings a message of peace to the nation and the world. Events and live entertainment continue at the National Christmas Tree throughout the holiday season. See photos of the National Christmas Tree. 2018 Date TBA. 3401 Idaho Avenue, NW Washington, D.C.The event will feature live performances of holiday tunes, free photos with Santa, festive giveaways and food and drink offerings. The tree lighting will take place at 7 p.m.
2018 Date TBA. Tree Lighting at 7 p.m. 2300 Washington Place NE, Washington, D.C. The holiday event includes live performances, photos with Santa, festive entertainment and more. Rhode Island Row is the new flagship location for the WPGC Coat Drive 95, in partnership with Salvation Army. December 4, 2018, 5:30 p.m. 2401 M St. NW Washington, D.C. The courtyard becomes a glittering crystal garden the perfect venue for a holiday celebration. Complimentary hot chocolate and cookies, performance by the award-winning Georgetown Visitation Madrigals. Santa Claus and Rudolph will make a special guest appearance. Bring an unwrapped toy to donate to the Toys for Tots Program. December 5, 2018, 5 p.m. West Lawn of the U.S. Capitol. Listen to holiday music by a section of The United States Marine Band (The President's Own), and carols sung by the Congressional Chorus. 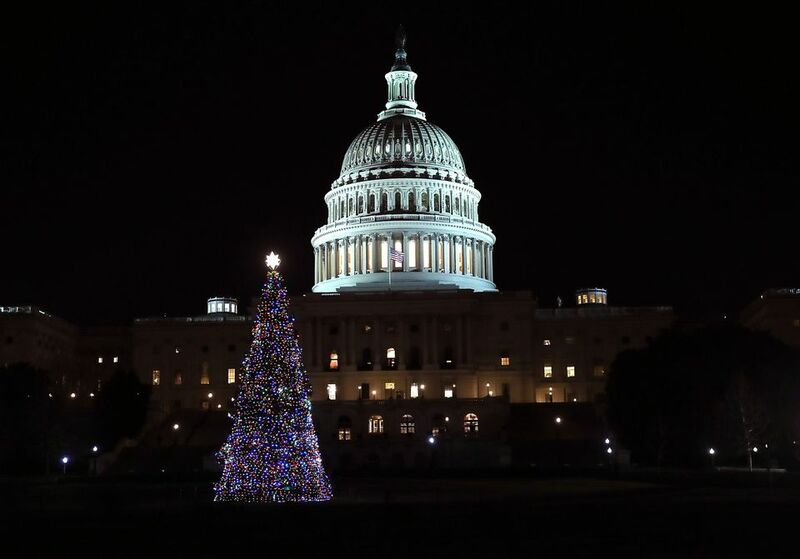 See photos of the Capitol Christmas Tree. November 10-December 22, 2018, 12:30-6 p.m. Waterfront Plaza, National Harbor, MD. The waterfront community will kick off the holiday season by lighting up the sky with fireworks and a huge Christmas tree decorated with two million lights. Sip some hot chocolate and enjoy story-telling, an ornament-making workshop and holiday music. November 10, 2018, 6-9 p.m. Downtown Silver Spring, MD. The annual Re-Imagining the Holidays Tree Lighting Celebration presented features an impressive 35-foot-tall public art installation comprised of 200 illuminated and multi-colored umbrellas. The evening includes live entertainment, face painting, balloon artistry, and more. November 16, 2018, 6-8 p.m. Lakefront Plaza, Gaithersburg, MD. Kick-off the holiday season with the annual tree lighting celebration. Meet Santa & Mrs. Claus, strolling holiday entertainment, horse and carriage rides and more. November 25, 2018, 5:30-9 p.m. City Dock, Annapolis, MD. Kick off the holiday season with the annual lighting of the tree. Watch Santa arrive by horse and carriage and enjoy dancing and carols sponsored by the Annapolis Jaycees. December 1, 2018, 6-7:30 p.m. City Hall Concert Pavilion, 31 South Summit Ave, Gaithersburg, MD. (301) 258-6350. Gather with the Gaithersburg community and celebrate the beginning of the holiday season with a holiday sing-a-long, tree lighting, take-your-own-photo-with-Santa, and free hot chocolate. December 1, 2018, 5-8 p.m. Bollman Bridge at Historic Savage Mill , then Carroll Baldwin Hall on Foundary Street, Savage, MD. Enjoy live music throughout the evening. The unique shopping destination will be adorned with an array of gigantic wreaths, lights, ornaments, trees, and garland. November 16, 2018, 6-9 p.m. 4100 Monument Corner, Fairfax, VA. Meet Santa & Mrs. Claus, horse and carriage rides, holiday entertainment and more. November 15, 2018, 6-8 p.m. Tysons Corner Center Plaza, 1961 Chain Bridge Road, McLean, VA. The lighting ceremony will include live entertainment. The 52’ signature tree will be lit through January 1, 2019 and be accompanied by a nightly light show. November 17, 2018, 4-7 p.m. 1602 Village Market Blvd, Leesburg, VA. Santa arrives by horse-drawn carriage to visit with the children in Leesburg. Don’t miss the Grand Finale at 5 p.m. when he lights the Spectacular Musical Tree. The festivities include horse-drawn carriage rides, musical performances, caroling, holiday characters, cozy fire pits with hot chocolate and roasting chestnuts and more festive fun. Attendees are encouraged to bring a toy to be donated to Toys for Tots. November 23, 2018, 6-8 p.m. Historic Market Square, Old Town Alexandria, VA. (703) 838-5005. Enjoy musical entertainment with greetings from the Mayor and Santa Claus. November 23, 2018, 5 p.m. Market Street & Fountain Square, Reston, VA.Celebrate the start of the holiday season in Reston with a performance of The Nutcracker and a tree lighting. November 29, 2018, 6-8:30 p.m. Arlington, VA. Families are invited to take photos with Shirlington’s Santa Claus and participate in activities for children. Horse-drawn carriage rides through the village will also be available. 2018 Date TBA. 2910 District Avenue, Fairfax, VA. Mosaic will celebrate this holiday season with a series of shopping events, holiday festivities and entertainment. Kick off the season at the Holiday tree lighting and sing-along in Strawberry Park. November 30, 2018, 5:15 p.m., Manassas Museum Lawn, 9101 Prince William Street, Manassas, VA. (703) 361-6599. Enjoy sidewalk carolers, horse drawn carriage rides, ice skating, refreshments and more. December 7, 2018, 6 p.m. Town Green, 25 W Market St. Leesburg, VA. The event includes performances from local elementary schools, high schools, words from the mayor, council and guest speaker. Join in a holiday sing-a-long and stay in town for the evening for Leesburg’s First Friday event - local businesses and merchants will be open late to host some holiday cheer. 2018 Date TBA. Army Navy Drive and South Joyce St. Arlington, VA. The holiday celebration will feature an on-ice firework display, live entertainment, music, a shopping spree giveaway, food samples and more. The grand finale fireworks show will take place on the ice at 7:30 pm. December 1, 2018, 5-7 p.m. Loudoun County Parkway and Thorndike Street, Ashburn, VA. The community will celebrate the season with music, food and beverages, a tree lighting and spectacular laser show. 2018 Date TBA. Lake Anne Plaza (Waterfront) - 1609 Washington Plaza, Reston, VA. The holiday event includes a variety of festive activities ranging from the ever popular special visit from Santa (arriving on a lake barge), strolling carolers, a petting zoo, music, wine tastings, merchant specials, children’s crafts, cookie & ornament decorating, holiday arts & crafts market, holiday entertainment and more.